Information about Music: Do You Want to Learn the BASSOON? Do You Want to Learn the BASSOON? The bassoon and contrabassoon are the lowest or bass members of the oboe family and hence the woodwind family which consists of flute, clarinet, oboe and bassoon. Bassoons developed from the Curtal which was an earlier instrument in England and they came into use in the 17th century. The bassoon is generally made of maple eg sycamore maple and sugar maple,although polypropylene and ebonite are used to create a cheaper instrument which is great for students and outdoor use. It consists of tubing nearly 2.5m or 7-8 feet long which is bent double to allow the bassoonist to play it. A small piece of bent metal shaped like a crook is fitted to one end and to this crook is set a double reed. The bassoon has a distinctive sound and listeners often compare its warm, dark reedy sound to that of a male baritone voice. The sound is produced by blowing through the double reed which is made from two pieces of cane.The air vibrates through the reed and down the tubing. The various sounds are created when the player presses down the keys or covers holes in different configurations or finger patterns. The bassoon can play a large range of notes. The contrabassoon is bigger than the bassoon and sounds one octave lower. 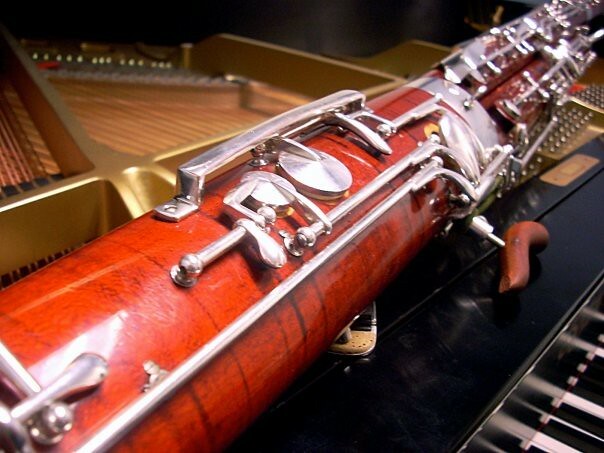 A bassoon is a large wind instrument and can not be held on its own like the flute, clarinet or oboe. Bassoon players can use a neck strap or seat strap for extra support. The bassoon is held diagonally in front of the player whilst being played. Bassoons are used in orchestras and chamber groups. There are usually two bassoonists in an orchestra with a possible third player playing the contrabassoon. The first bassoon player often has solos. A popular chamber group which the bassoon takes part in is the wind quartet which consists of 1 flute, 1 clarinet, 1 oboe, 1 bassoon, 1 french horn. And it is combined with other instruments in various groupings. The bassoon is rarely used in jazz or popular music. A couple of well known bassoon players are Bernard Garfield (born 1924) and Archie Camden (1888-1979) who was a soloist of international acclaim. Now that you know a little about the bassoons with its shape, sound production and types of music it plays, do you want to learn the bassoon? If you like the thought of playing low notes in a group or even by yourself, and blowing air through a double reed and tube to produce the sound then the bassoon could be just what you need.